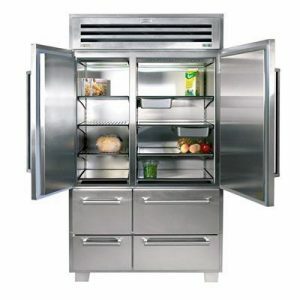 When it comes to choosing a new refrigerator, you won’t be able to do much better than a Sub-Zero refrigerator. You shouldn’t let the sleek design fool you; this is a very well made, hardworking refrigerator. When you purchase one you will also be getting the latest technology for keeping food cool. Once you own a Sub-Zero refrigerator, you’ll never want to use anything else. The one drawback to the Sub-Zero refrigerator will be finding a qualified repair tech. The technology used to make the Sub-Zero refrigerator tends to be a bit more than the average appliance repair tech can handle. You’ll want to find the name of a properly qualified tech and keep the name on hand. You’ll be happy to know that as long as you do a good job taking care of the Sub-Zero refrigerator, you shouldn’t ever have to worry about repairs, and the tech will be someone you never have to call. Caring for the Sub-Zero refrigerator doesn’t have to be hard, in fact it could be the easiest to maintain appliance in your entire house. The trick to keeping your Sub-Zero refrigerator in good shape and running smoothly will be keeping it clean. There’s a little more to keeping the Sub-Zero refrigerator clean than just wiping up the occasional spill. Even if you think that the interior of your fridge looks fine, once a month you should remove all of the food, and give the fridge a thorough, top to bottom, inside and out, cleaning. Not only will this destroy any bacteria that might be growing in your fridge, but it will also provide you with the perfect opportunity to sort through your food and trash anything that beyond its expiration date. You will want to avoid using harsh and abrasive cleaning solutions, which can scratch the finish, marring the Sub-Zero refrigerator’s good looks. As long as you’ve been diligent about wiping up spills, you shouldn’t need anything stronger than a bit of dish soap in some warm water. In addition to wiping down the inside of the Sub-Zero refrigerator, you also need to clean the exterior. Don’t forget to pull the Sub-Zero refrigerator away from the wall and vacuum behind it. You also need to use a toothbrush and scrub the seals, which can turn green with mold when neglected. In addition to making sure you keep your Sub-Zero refrigerator clean, you also need to plan on defrosting the freezer portion at least once a year, which will prevent frost from blocking the airflow. Do You Need Refrigerator Repair?